Pharmaceutical Excipients Market is expected to garner $6.4 billion by 2020, registering a CAGR of 7.6% during the forecast period 2015-2020. Pharmaceutical excipients are inert substances, other than the pharmacologically active drug, which are included in the manufacturing process or are present in the pharmaceutical product dosage form. Excipients are widely used in drug formulation to provide long-term stability, add bulkiness to solid formulations and facilitate drug absorption. They also enhance the overall safety or functionality of the product during storage or use. The world pharmaceutical excipients market size is evaluated to reach 728.4 kilo tons in volume by 2020, accounting for a revenue of $6.4 billion. The world pharmaceutical excipients market is driven by the increase in demand for oral solid pharmaceutical drugs and emergence of novel therapeutics on account of the upsurge in the number of pharmaceutical industries. The amalgamation of drug formulation and nanotechnology in excipients have led to the development of nano-coated tablets, nano-derived liposomes, and vaccines. In addition, several companies have targeted the emerging economies for expansion of their plants for manufacturing pharmaceutical excipients, preservatives, glycerin and Fatty Acids owing to cost-effective labor. However, higher production cost and stringent government regulations are likely to impede the overall growth. Applications including parenteral formulation, topical formulation and oral formulation are driving in huge investments. Moreover, the target audience consisting of reputed consulting firms, drug manufacturers, pharmaceutical excipients manufacturers, research & development companies will keep the future of the industry robust. This report segments the world pharmaceutical excipients market on the basis of type, function, and geography. Based on type, the industry is segmented into organic and inorganic chemicals. Organic chemicals are further categorized into carbohydrates and petrochemicals. Based on function, the world market is classified into fillers and diluents, binders, coatings, flavoring agents, disintegrants, colorants, and others. The industry has been analyzed on the basis of regions, namely North America, Europe, Asia-Pacific, and LAMEA. The North America is the leading revenue-generating region, owing to growing demand for solid oral drugs for the treatment of chronic diseases. However, the Asia-Pacific region is expected to register the highest CAGR, owing to low cost of raw materials and availability of cost-effective workforce. The key companies profiled in this report include Ashland, Inc., BASF SE, Associated British Foods Plc, Akzo Nobel N.V., Evonik, Merck, J.M. Huber Corporation, Dow Chemicals Corporation, Merck Millipore, Croda International, and Archer Daniels Midland. These companies have adopted product launch as their key developmental strategy to expand their global presence. The Pharmaceutical Excipients Market report offers an extensive study of the current trends along with the future market scenario across various geographies. It provides detailed quantitative statistics of the current corporate structure and forecasts from 2014 to 2020 to identify the prevailing investment opportunities. It delivers an in-depth analysis of the key driving and restraining factors of the market. 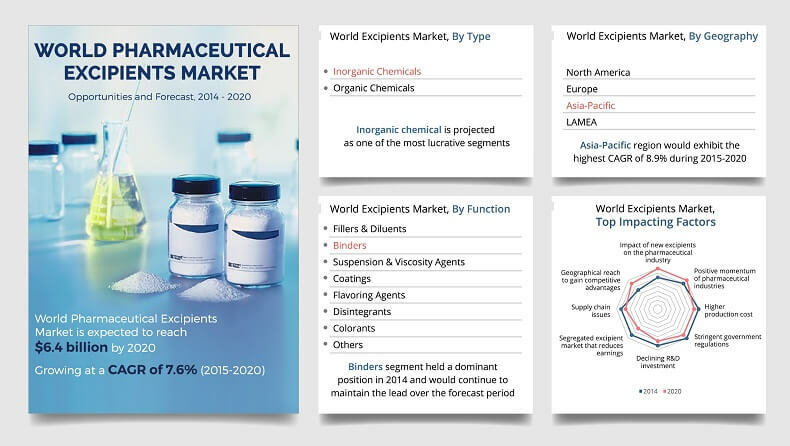 The key manufacturers of excipients have been profiled and their growth strategies are portrayed in a comprehensive format to outline the competitive landscape. 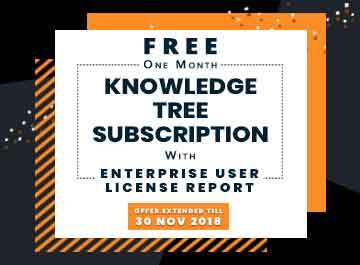 It offers detailed insights on new product launches and research and development activities taking place in the excipients industry. SWOT analysis highlights the global positioning of leading manufacturers in the industry to formulate effective growth strategies. The world pharmaceutical excipients market has been analyzed on the basis of regions to understand the regional trends across various geographies. 7.1.4 Key strategies of Ashland Inc.
7.1.5 SWOT analysis of Ashland Inc.
7.10.4 Key strategies of Croda International plc. 7.10.5 SWOT analysis of Croda International plc. FIG. 13 SWOT ANALYSIS OF ASHLAND INC.